Now in its sixth decade of operation, John Guest Limited is the world’s leading manufacturer of high-quality push-fit fittings and associated products. The company supplies its comprehensive range to a variety of demanding industries, including the automotive, drinks dispensing, pneumatic and fibre optic markets. Although, it is the plumbing industry that is most associated with the use of John Guest’s push-fit systems under the JG Speedfit brand. The easy to use JG Speedfit, plastic push-fit system is suitable for the plumbing of both hot and cold water services and heating applications. The flexible system has the ability to significantly reduce installation time and negates the need for specialist tools. The fittings are lead free; they remove the risk of scale build up and are able to withstand temperatures and pressures well in excess of normal working conditions. JG Speedfit’s high quality plastic pipes are manufactured in the company’s impressive extrusion facility in Maidenhead, Berkshire. They consist of 5 layers of material, at the centre of which are 2 blue coloured adhesive layers surrounding a clear oxygen barrier. This prevents the ingress of air into the system and reduces the effect of corrosion on metal components. As the reliability of the JG Speedfit system depends on the integrity of the materials used and the strict adherence to exacting dimensional standards, John Guest applies strict quality standards to the company’s products. To enable these standards to be maintained, in addition to investments in advanced manufacturing technology, John Guest makes regular purchases of state of the art quality control equipment. To help ensure the correct dimensions of each layer of material in the company’s pipes and their OD and ID sizes, a search was made for a precise, non-contact measuring system. Having considered other options, a Venture Vision System was purchased from Baty International. Peter Short, Extrusion Factory Manager explained, “To keep-up with the demand for our output, we operate a range of high volume extrusion machines to produce our multi-layer pipe, in sizes from 3mm – 15mm. The quality of our extruded pipe is of paramount importance to us, so throughout the manufacturing process we take samples from production. We make cuts to expose the pipes’ cross sections, and then take very precise measurements of the various material layers and outside and inside diameters. “Informed by these detailed inspection results we are able to make small adjustments to our manufacturing processes to correct even the most minute of deviations from our products’ nominal dimensional tolerances. “Prompted by the need to speed-up and improve our important measuring process, we looked for a technology that would enhance this critical function. As the material layers that make-up our pipes are deformable, the required solution needed to be of a non-contact nature. “Having considered a couple of alternative products, we believed that the Venture Vision System from Baty International was the best system for our needs. Now delivering the required speed and accuracy, the Baty vision system has proven very easy to use. In addition to simple manual controls the Venture’s Fusion software is also very intuitive. The original design brief of the Venture range was to bring together high-end software functionality and quality optics within a proven mechanical design, all at a competitive price. Having achieved these objectives, since its launch the highly successful Venture range has achieved global success. Available as manual and full CNC systems, the recently updated range includes more functionality as standard than any other vision system package currently available. Full geometric functionality enables features such as circles, lines arcs and points to be measured easily. When undertaking a measuring routine, data points are automatically taken along the edge of the feature being inspected using video edge detection. Programmable LED lighting enables surface, through the lens and profile lighting conditions to be adjusted to ensure that the every edge is perfectly illuminated. Tolerances can be set for each dimension so that final inspection reports clearly display a pass or fail status. For parts that need to be measured regularly, measurement routines can be conveniently recorded, saved, recalled and used. Throughout this trouble-free process the operator is guided through the process by display prompts. 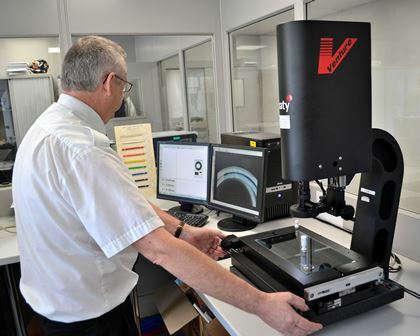 Magnification, VED tool positioning, number of data points required and the exact lighting conditions are all reproduced by the system, ensuring that each part in a batch is measured in exactly the same way. Ideal for use in both quality departments or on the shop floor, the robust, yet accurate Venture system boasts a long list of superior standard features. The use of high resolution 0.5 μm scales ensures high precision. A Z-axis dovetail slide mount provides increased Z-axis capacity, whilst a high precision cross-roller stage and ultra-smooth plain rod drives provide trouble free operation. As with all Venture models, a high precision zoom lens is featured as standard. The manual Venture has 6 pre-set zoom positions which provide a magnification range from approx. 30x – 200x. Each pre-set position is pre-calibrated enabling the user to quickly select the optimum magnification for each measurement and continue measuring. In addition to a graphical representation of the measured part, detailed reports can be instantly created showing the feature name, nominal dimension, actual, error, upper and lower limits and a green pass or red fail label for each measured dimension. Geometric tolerance details can also be displayed along with thumbnail views of parts and batch/customer information. Baty’s Venture Vision System uses the company’s renowned Fusion software. The easy to use software features gully dimensioned part view, CAD import / export, profile scanning and best fit to CAD master, SPC batch information including control charts and auto output to Excel.